Cold weather can completely ruin your camping experience. This is particularly true during ice-cold nights that render every living thing immobile. That is why most people prefer to camp during warm weather seasons. Nevertheless, you can easily spice up your winter camping expeditions with topmost tent heaters and keep the cold at bay. There is scientific evidence to show that seasons influence human moods and emotional behavior. The gleams of sunshine keep the physical being glowing and inner being burning with positive energy. In fact, according to an article by the Huffington Post, warm days are scientifically linked to mood boost. During spring, even the dead cold hearts jump with excitement. That is when you find most individuals stepping out of their comfort zone to enjoy the blessings of bright sunshine. But why limit your excitement to the natural season when you can create your own sensations? All in all, there are ways to spice up your camping experience beyond weather conditions. Packing up your own heating apparatus to the camp-grounds keeps the cold away. Tent heaters are the most convenient way of achieving this. 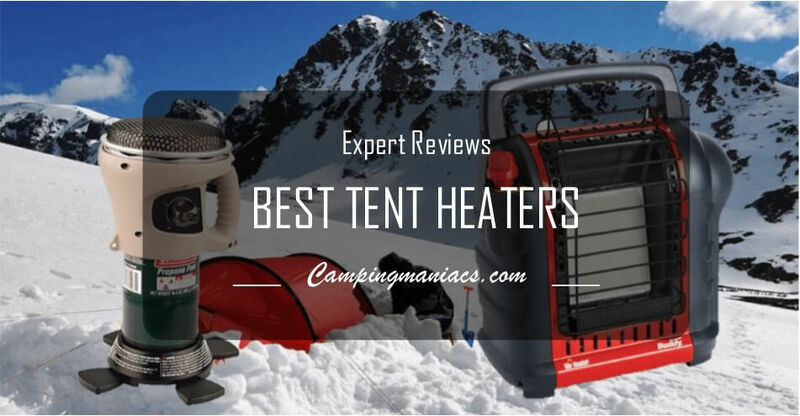 Accordingly, in the section below we provide a detailed review of the best tent heaters for camping. We have categorized the heaters into gas/propane and electric tent heaters to simplify the list for you. Just like the name suggests, this heater is every camper’s best friend during cold days and nights. It has always been my go to option whenever I set out for a camping trip (This happens quite often by the way) and to be honest, it has never ruined my adventure. It is packed with awesome features that have enabled it to establish a solid reputation in the heater’s market. Firstly, it is compact and portable. Its dimensions are 9 inches by 14.2 inches by 14.4 inches. Its overall weight is 9.7 pounds. Its heat settings are two and they include 4,000 and 9,000 BTUs per hour. The necessary amount of BTUs is controlled by measuring space dimensions (the area where you intend to use the heater). Generate the cubic feet figure by multiplying the length, width, and height. This provides users with an opportunity to control the warmth in their tents depending on the nature of the weather conditions. Other interesting features that you can find in this heater include four control positions with built-in Piezo igniter off and lo/hi heat settings, low-oxygen safety shut-off (ODS) functionality, high temperature wire guard, swivel regulator (It allows easy installation of LP cylinder and hose), tip over safety shut-off, large durable porcelain collated heating surface, and ceramic burner tile. The large durable porcelain heating surface ensures that heat is directed over a large area. The burner tile is mounted with shock absorbing insulation to increase its durability and ensure that it can be easily replaced. Overall, this is a great portable propane heater that provides enough warmth in enclosed spaces. It is designed to heat up tents of up to 200 square feet. Most importantly, it is easy to use. You only need to connect it directly to a 1 lb. cylinder. The technology of the heater ensures that users derive maximum heat benefits while minimalistic footprint is maintained. A swivel generator increases the adaptability of the heater. 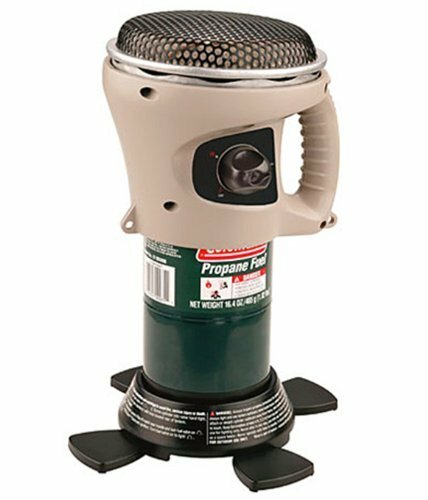 If you are on the lookout for a small propane heater, this little catalytic heater is everything you need for a truly fascinating camping experience. Its dimensions are (H x W x D) 21.25 x 15 x 4, 3/8 inches. Although it appears small, its heating surface is large enough to distribute heat evenly in a large space. It is available in three sizes ranging categorized by heat output: 3000 BTUs, 6000 BTUs and 8000 BTUs. A 6000 BTUs heater can heat up an area of up to 230 square feet. Camco Olympian is one of the few portable heaters that operate on low pressure gas and can be mounted on a wall. Therefore, you do not necessarily have to use it as a portable unit. In addition, it has a safety shut-off feature for advanced safety when in use and for preventing accidental non-ignition fuel discharge. It has a built-in automatic Piezo electric sparker that should last up to 20,000 starts. All these characteristics make this heater 99% efficient, extreme safe and easy to use. Most users have complained about the durability and quality of the product. We could however not verify this since our experience with the heater has been nothing but awesome. This is a reliable heater that will serve you religiously. Its compact design and portable size make it an ideal gear for any trip and for an array of spaces. For instance, it can be used in workshops, garages and other places where it can be wall-mounted. This means that your heater won't be idle-sitting when you are not out camping. Since the heater does not require electrical drain or battery connection, it is a highly effective solution to dry camping. This butane heater is affordable and convenient. Just like it appears in the picture, it is small and lightweight. Its length, width, and height dimensions are 11.6 x 10.9 x 7.9 inches and its overall weight is 5.4 pounds. This heater uses standard butane gas to produce heat. The heat is enough to keep an enclosed room or a relatively large tent warm. It only takes a few seconds for the heat to set in once the heater is turned on. The top section of the heater swivels allowing heat to be directed towards a specific place. Other interesting features found in this heater include a ceramic burner, pressure sensing shut off device, and an external connector for butane. This is a nice portable tent heater that comes with a lot of convenience in terms of usability and portability. Since it is small and light, it can be easily moved from one location to another. It is easy to use and produces a lot of heat. You will enjoy its service even in the coldest days of your adventure. It is easy to control the direction of the heat by manipulating the swiveling function. This is a high quality tent heater that will keep your camping days running smooth throughout. It is designed to produce up to 40,000 BTUs of heat. The heat is safe and free from toxins. Zodi Outback Heater is fitted with an x-40 vent that keeps carbon monoxide at bay. 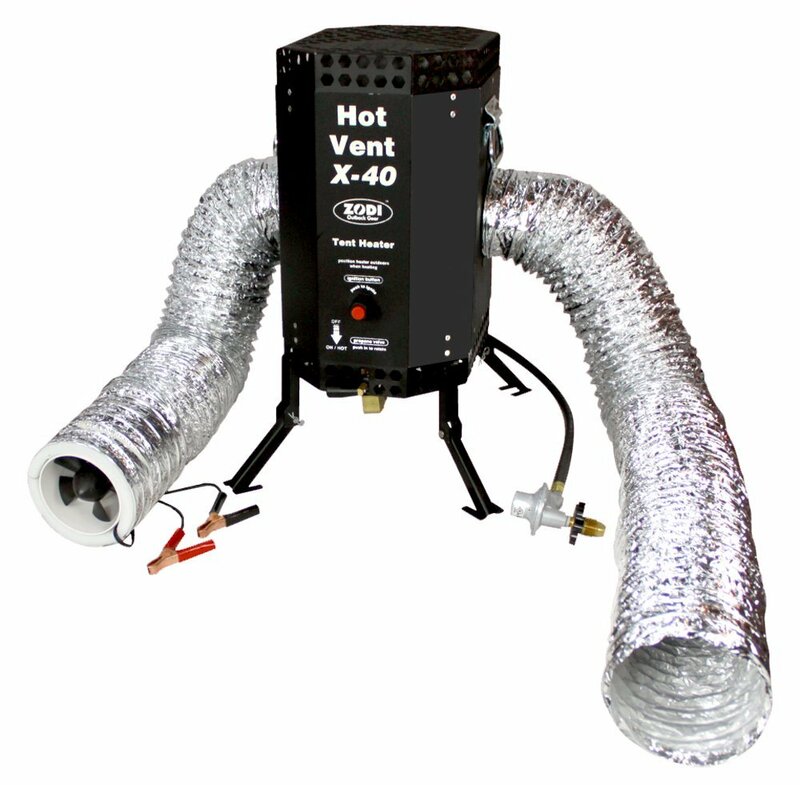 The vent features stainless steel sealed heat exchanger, compact 12 volt inline fan, and flexible 4 feet air hoses. The overall design of the heater is compact and portable. It comes with an excellent storage bag that allows you to transport the product anywhere, anytime conveniently. Once the heater is turned on, the heat sets in within a few seconds. However, it is important to note that the product is not recommended for children under the age of 8 years. Furthermore, it contains some components that the state of California considers as cancer causing agents. Overall, the quality of this heater is amazing and that explains its relatively high cost. Its most prominent feature is the ability to produce safe and intoxicated 40,000 BTUs heat. Generally, it is very easy to set up. All that is required is to connect it to 12 volt power and a propane tank. Make this little heater your camping companion and you will never be disappointed. It is a great portable catalytic heater for every traveler. It does not matter whether you are going for fishing, camping, hiking, or hunting. It will make all your outdoor activities significantly easier and convenient. Firstly, it is fitted with an easy-grip handle for convenient carrying. Furthermore, the design is compact and does not require a collection of accessories. You only need to attach a propane cylinder and you are good to go. Its overall design is portable and lightweight; its dimensions are 9 x 9 x 9 inches. This is a 1500-BTU heater that is designed to run up to 14hrs on one 16.4 can of propane. This is incredible span of time considering the amount of heat that it produces. Most heaters cannot run for this long with such amount of propane. It has a feet design base that offers a lot of stability. However, it can be detached when necessary. Other awesome features provided include; PerfectTemp Catalytic technology, flameless heat, and built-in eyelets that allow users to tie the heater to surfaces for enhanced safety. This is a great outdoor equipment that not only benefits you with extra warmth, but also works great in locations such as garage, cabin, and outside enclosed spaces .It has an uncomplicated design that is very easy and comfortable to use. This heater is everything you need for your outdoor activities. Its design brings together a variety of incredible features that are meant to make your experience forever memorable. The heater features a high quality stainless steel burner that does not develop rust even in extreme weather. It has a large paddlefoot base that is made with high quality plastic material. Its purpose is to enhance stability and support when the heater is in use. Unstable heaters can tip over easily and burn an enclosed space. An auto shut-off fuel valve is another safety feature available in this propane heater. Its role is to ensure that the fuel valve shuts off immediately the flame goes out. It adjusts heat up to 2,890 BTU’s and works well with propane fuel cylinders of 16.4 oz. or 14.1 oz. The manufacturers have provided an aluminum reflector with safety grid and a handle for easy transportation of the heater. Other interesting features for this include copper hardware finish, 847 watts, and use of steel in the overall construction. Lastly, Texsport propane heater is available in two sizes that include; one size, and pack of 2. The pack of two is the most economical. This is an excellent adventure equipment and unless you mess it up, you will not be disappointed. It is safe to use when you are sleeping because of the paddle feet that make its stand unshaken for a long time. Furthermore, the fuel valve shuts automatically when necessary. Whether you intend to use it for camping or other outdoor activities during cooler weather, it will keep you and your companions feeling warm and cozy. Allegro Industries heater is one of the best electric tent heaters that you can find in the market today. It is characterized by incredible features that allow users to enjoy enough warmth even in extremely low temperatures. In addition, it is compact and portable. Its height, width, and length dimensions are 12 inches x 14 inches x 12 inches respectively. The product’s weight is approximately 14.0 pounds. Other important specifications of heater are 1500.0 wattage and 120.00 voltage. The heater is made with rigid metallic material on the outside and it has a 5 blade fan. Allegro Industries tent heater lives up to its expectations. Most of its features are designed to ensure that users derive maximum heat. Its rigid metallic exterior increases safety and durability. Lastly, the size and weight of the heater are convenient for a travel luggage. At less than $50 this can only be described as an excellent small electric heater. Its overall design is compact, lightweight, and portable. The length, width and height dimensions are 12.5 x 11 x 14 inches and its weight is 8.6 pounds. This COSTWAY heater is fitted with a front carry handle for increased convenience when moving it from one place to another. With power output of 700 watts, this heater produces enough heat to warm up a relatively specious room on a dead cold day. Furthermore, it features an adjustable thermostat that should be regulated to control power output. This allows users to achieve desired temperatures in a room at a particular time. Sealed oil technology has been used to ensure that the heater maintains oil permanently without refilling. The purposes of this feature is to enable the heater warm up a room in the shortest time possible. In addition, a heat control has been built-in so that the heater can shut off automatically when it is lopsided or overheated. Lastly, this heater comes with a one year warranty. It is a compact heater whose portability is enhanced by the fitted carrying handle. Generally, this is a very convenient heater that will save you space and provide enough warmth. Although available in one size only, it is packaged with outstanding features especially when it comes to safety and user convenience. From a power indicator light that keeps users notified when the heater is turned on to an auto shut-off feature, this heater does not compromise your safety and that of your family’s. Lastly, the powerful performance of the heater is coupled by easy movement from room to room because of the availability of a handle. This is one of the most outstanding electric heaters that you can find in the market today. It features a lightweight, compact and highly portable design that allows users to travel with it to all kinds of destinations. The product dimensions are 7.2 inch by 7.2 inch and it is 16.18 inch tall. Its overall weight is approximately 7 pounds. Other specifications of the heater include 1500 watts of heat output and a 7 hours timer with auto shut-off. This heater features a modern design where everything is fully assembled for improved user experience. Once turned on, the heat spreads in a few minutes throughout an enclosed room. The heat can be controlled to low and high settings depending on the desired room temperature. The heater is backed up with safety features such as an automatic shut off. Its role is to shut the heating process off after overheating has been detected. Other interesting features include decorative metallic scrollwork base, electronic-touch control operation, oscillation for broad coverage, a remote control function, and two quiet settings. The base and overall design of the heater blends well with surrounding décor especially when the heater is used in homes and offices. The technologically advanced control features (touch control and a remote) provide advanced user experience. Lastly, this heater comes with a three years warranty. This powerful yet affordable heater provides instant warmth without compromising your safety. It has the necessary control features to help achieve the desired room temperature. Furthermore, it is easy to use and the controls are self-explanatory. Its compact and fully assembled design makes it easy to use in remote areas. The efficiency of this heater by Comfort Zone is quite impressive. This little performer supplies users with safe and clean heat in a silent mode. It weights a total of 3.1 pounds and its dimensions are 8 x 6 x 6.8 inches. The heater has two heat settings and one fan only settings. The low heat settings works well in very small spaces whereas the high setting is the best for a room or tent. Its output capacity is 1500 watts and it directs heat to a specific direction before the warmth spreads out in an enclosed space. It uses propane and should be connected to an external source of fuel (Propane tank). However, the tank is not provided. A fold down handle design has been used to maximize the output of the heater while maintaining a minimalistic footprint. Other interesting features provided in this heater include; durable metallic housing construction, a carry handle, protected electric wire heating system, and a tip-over switch with power and indicator lights. The metallic housing construction protects users from sensitive parts such as the electric wire heating system. A carry handle is for holding the heater when moving it. Lastly, the tip-over switch is for safety enhancement. It works with caution indicator lights to caution users. The quality of this heater meets the necessary standards. It’s extremely simplified design allows you to achieve maximum warmth in your room or tent effortlessly. Furthermore, the heat can be adjusted in terms of output and direction to suit your needs and expectations. Acquire one with confidence because you will not be disappointed. The most superb feature of this rugged electric heater is its multiple heat control settings. They include; 1 anti-freeze setting, a fan only setting, and 3 heat settings. The heat settings allow users to control heat output from low/steady to highest/maximum. The anti-freeze setting becomes useful during freezing days. It automatically turns on when the surrounding temperatures fall below three degrees. This ensures that the air in a room remains above the freezing point. The fan only mode sets in the fan mode. Overall, this heater is made of solid and durable steel housing. The thermostat is built-in and well protected by the solid housing. It has a compact and lightweight design that is easy to carry around. Lastly, it comes with a five year warranty. This gives users more than enough time to test its performance and quality. Based on the options that this heater gives its users, it is reliable in all kinds of settings. The antifreeze option is not only unique but also outstanding based on how it functions. Whether you intend to you this in a campsite, boat, or at home, it will reward you with enough warmth to keep shivering at bay. This is the main factor to consider when buying a tent heater. Different types of tent heaters are powered differently. The three main sources of power include; gas, electricity, and chemicals. Butane and propane are the two types of gases used to power tent heaters. Propane can be defined as liquefied flammable hydrocarbon gas. It is found naturally and produced during gas processing. Its main advantages ease of availability and safety. It is readily available and fair prices and very safe when used appropriately. Butane gas is commonly used for cooking appliances and camping gear. Just like propane, it is highly affordable and generally safe. Most tent heaters that use gases have automated safety features that turn-off when necessary. The main disadvantage of butane and propane gases is the need for constant refilling. However, this depends on the level of consumption entirely. Other limitations include; oxygen depletion in extremely high altitude locations, bad smell from burning, increased risk of accidents when sleeping with a turned on heater in a room. It is advisable to ensure that your room or tent is well ventilated when using a tent heater that is powered by butane or propane. These gases produce unsuitable residue that can make the air in your enclosed space uncomfortable and unsafe. Electrical tent heaters are powered by electricity. Accordingly, users must be able to access electricity for an electric heater to be useful. This limits the choice of your camping destination. There are many fantastic camping destinations that do not offer electric hook ups. The most prominent benefit of electric tent heaters is advanced safety. They are the safest. They can be left running overnight without any worries. Furthermore, they do not produce any kind of residue or smell. Their heat is safe and 100% clean. Fire hazards are almost impossible with electric tent heaters because they do not produce open flames. On the downside, unlike gas heaters, they produce relatively low heat. Therefore, they are more suitable for relatively smaller spaces and tents. Chemical tent heaters use non-toxic chemicals to produce heat. Sodium acetate is the main chemical used. However, these heaters are rare when compared to electric and gas tent heaters. Chemical heaters are reusable, environmental friendly, and easy to use. On the other hand, they are less effective, pricy, and can trigger irritation to individuals with skin sensitivity problems. Unless you want to make your trip cumbersome, portability is another factor to consider when purchasing tent heaters. Consider factors such as size, shape, accessories, and weight when determining the portability of a heater. The smaller the size of a heater, the more convenient it is for camping, hiking, and other forms of outdoor activities. A small heater can easily fit in a travel bag without occupying too much space. Furthermore, small heaters are mostly lighter. The weight of heater influences your flexibility in terms of movement. It is very difficult to move from one place to another with a heavy luggage. A heater might be light but its accessories can increase the weight of your luggage unnecessarily. The best approach is choosing a heater with the least accessories. A large collection of accessories is also associated with storage limitations. Price influences the quality of a product. Normally, higher prices are associated with better product quality. Although this is not always the truth, it works perfectly most of the time. Conducting a thorough research and determining the reasons behind the price of a heater is always fundamental. Read in details and if possible watch reviews to understand all the features provided in a heater. A heater with more elaborate features is likely to cost more. Besides features, factors such as material, heat output, size, and energy efficiency influence the price. Do not limit yourself. Sometimes, acquiring the best product in the market can leave holes in your pockets. In this case, buy a heater that fits within your budget range. They is a number of low priced heaters that function perfectly. The amount of heat output varies with heaters. Some heaters produce more heat than others. Consider the size of your tent or enclose room, and the number of people using it to determine the heater that will provide sufficient heat. This is a common problem with propane and butane heaters. However, it is just a few poorly made that produce unbearable noise. The main factor here is quality. It is always advisable to part with more money for better quality. These are features designed to ensure that fire hazards and other forms of risks are prevented when need be. For example, a heater may turn off automatically in high altitude areas to prevent oxygen depletion. Topple-over shutoff feature is a common fire prevention measure in most tent heaters. So before acquiring a heater, make sure to check for advertised safety measures and whether these are the most suitable for your needs. This mainly applies to butane and propane heaters. Look at the consumption specifications before buying a heater to avoid disappointments. Some heaters can make your trip dull by consuming all your packed fuel before your trip is over. Besides using tent heaters, there are many ways in which you can keep yourself and your tent warm during camping. Below is a list of easy tips for generating extra warmth. Always carry warmth clothes and accessories especially during winter. Things such as gloves, leg warmers, heavy jackets, hoods, socks and heavy blankets are cold weather essentials. Besides keeping the body warm, they prevent the development of cold-related infections. Even in hot weather, warmth clothes are very important. Some regions experience extremely cold nights during hot weather. If you are camping during the rainy season, carry a rain coat and other rain accessories to protect your clothes from soaking with water. Keeping wet clothes in an enclosed space/tent can be dangerous to human health. Eat food that provide the body with extra warmth. Food substances perform different functions in the body. There are foods that allow the body to produce extra heat. Paying more attention to them during camping can keep the body warmer. Choose the location of your tent wisely. Avoid slanting places or near stagnant water. Also, observes the patterns of natural forces such as wind and snow. Which is the best option for camping between gas and electric heaters? Both gas and electric heaters are good. It all depends with the nature of your trip. An electric heater only becomes useful when travelling to a camping destination that provides electricity and the necessary accessories for plugging in gadgets and electronic devices. On the contrary, gas heaters are convenient for all camping destinations unless you are camping in extremely high altitude areas. In terms of performance, both types are good but not perfect. Mostly, electric heaters produce less heat whereas gas heaters require proper ventilation because they can use up all the oxygen in a room. Is There a Battery Operated Heater for Tents? It has been the dream of many to access a battery operated heater for tents. But the question is: are there any battery operated heaters for tents? Spoiler alert: no any such a thing in the camping world. But why, most people ask. Since electric heaters consume a huge amount of power, it would be virtually impossible for a battery to sustain such power consumption. Not even with an AC inverter because your battery will be discharged before your tent gets warm. How can I use a tent heater safely? Firstly, this entirely depends on the type of heater that you are using. Gas heaters should be used in a well-ventilated room or space. This is because they operate through fuel combustion where oxygen is consumed at a very high rate leading to the release of carbon dioxide. Carbon dioxide can easily cause suffocation and eventually death. Avoid operating gas heaters while sleeping for increased safely. It is very dangerous to sleep while a heater is running especially if it produces a flame. It is difficult to predict the events that are likely to take place. Avoid extension cords when using electric heaters. Some cords can interfere with the effectiveness of a heater thereby triggering damage or fire hazards. Overall, all heaters should be operated in a safe place to avoid establishing contact with combustible materials. Consider important safety features such as auto-shut off and oxygen depletion sensors when buying a heater. They detect when the environment is unfriendly and proceed to initiate the necessary action. How long does a gas tent heater run? This entirely depends on the power consumption design of a heater and the attached gas cylinder. Heaters with high power consumption capacity require more gas to run for long hours. However, most of them produce more heat.